A biographical drama, A Private War covers chapters from the career of war correspondent Marie Colvin. The film opens in 2012 in the devastated Syrian city of Homs, reduced to rubble as part of the raging civil war. In flashback, Colvin's prior assignments for the British Sunday Times newspaper are recalled. In 2001, she covers the conflict in Sri Lanka and loses her left eye during a battle between the army and Tamil rebels. In 2003 she is in Iraq, pursuing the location of a mass grave of civilians to uncover one of Saddam Hussein's atrocities against his own people. She witnesses the horrific outcomes of an improvised explosive device. In 2011 she is in the midst of the Arab Spring uprising, and enters a war-torn Libya to interview besieged and delusional leader Muammar Gaddafi. Despite accolades and recognition throughout the journalism world, the hard-drinking and chain-smoking Marie's constant exposure to war and its impact on civilians induces post-traumatic stress disorder, and she spends time in rehabilitation. But she is inexorably drawn to conflict zones, and enters Homs at the height of the Syrian conflict. 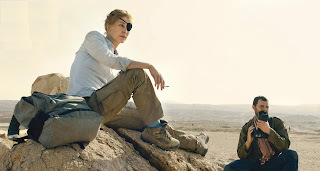 Written by Arash Amel and based on the Marie Brenner magazine article, A Private War combines the biography of a troubled and courageous journalist with a horrors-of-war exposition. The film is episodic by nature, and hampered by a singular focus on Marie. Her in-field colleagues Paul Conroy (Jamie Dornan) and Norm Coburn (Corey Johnson) barely register as individuals, and in her private life lover Tony Shaw (Stanley Tucci) is presented as nothing other than a convenience. 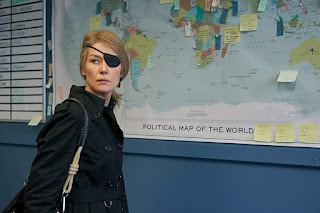 With Rosamund Pike in fine form, some of these shortcomings are overcome by director Matthew Heineman as he delves into the soul of a woman pulled to the site of the world's worst inhumane corners to record the often covered-up indiscriminate violence against defenceless civilians. She visits hellholes so that others don't have to, and to try and nudge the soul of an often uncaring world into action. That the brutality cycle repeats only in different settings undoubtedly contributes to Marie's emotional disintegration. The film's final chapter is a harrowing recreation of Homs reduced to rubble, with reporters and civilians trapped and barely surviving as death rains from above. Marie transmits to the outside world to once again try and poke public consciousness towards witnessing the uncomfortable. Large scale atrocities are nourished by indifference, and Marie Colvin dedicated her life to turn apathy into empathy.